There is an organization in Israel known as “The Temple Institute”. This organization is committed to seeing the third temple built on Mount Moriah in the Holy City Jerusalem. This is not the only organization preparing for the future third temple. King David’s son Solomon built the first temple during his reign in the 10th century B.C. It was destroyed in approximately 586 B.C. by the Babylonians. The second temple was destroyed in 70 A.D. by the Romans and this was the temple that stood during the life of Yahshua Jesus. In approximately 690 A.D. a Muslim shrine, known as “The Dome of the Rock” was erected on the center of the Temple Mount platform. This structure has remained until this present day. The temple institute is dedicated to the building of the third temple on the spot of the two former temples. It seems like an impossible task in light of the fact, that the Dome of the Rock stands at the very spot where the two former temples are supposed to have stood. This has not stopped the Temple Institute from moving forward with preparations. The ancient temple had a candlestick with seven branches as it were. It is found in Exodus chapter 25, and it is what we now refer to as a Menorah. The Temple Institute has prepared a Menorah for the future third temple that is worth $2,000,000 dollars. It is reportedly plated with 95 pounds of gold. 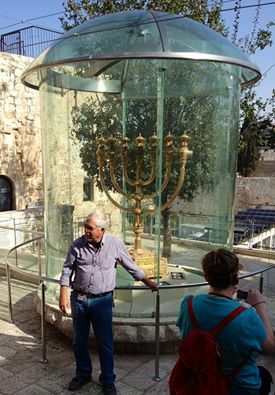 It has for the time being been placed in a glass-like case and positioned in a spot overlooking the Temple Mount: its future location for when the time is right. The Temple Institute has also expended great effort and resources researching the alter, the incense, the laver, priestly garments, the table of shewbread, cherubim, pure olive oil, the red heifer, and all the necessary pieces needed for the third temple and has produced well over half of them. Google “The Temple Institute” for more information. The organization “Temple Mount and Land of Israel Faithful Movement” has prepared a 13 ton cornerstone for the third temple and paraded it through Jerusalem and to the Temple Mount in 2009. Israel is at the present a predominantly secular nation; however, there are many ten thousands in Israel, who are keenly aware of the spiritual nature of Israel. Many send up prayers three times daily, that the third temple would be rebuilt. I would like you to notice the words of Christ Himself in Luke 21:24, ” …. and Jerusalem shall be trodden down of the Gentiles until the times of the Gentiles be fulfilled.” During the Six Days War in 1967, Israel took over Eastern Jerusalem and the Temple Mount. Shortly thereafter, Israel allowed the Jerusalem Islamic WAQF to exercise control over the Temple Mount. I believe this must have been an act of Almighty God in the fulfillment of Luke 21:24. It seems bizarre, that Israel would seize sovereignty over the Temple Mount and then voluntarily grant the Jerusalem Islamic WAQF custody of the area. The prophecies in the Holy Bible must be and will be fulfilled. I have pointed out in a previous post, that 2 Thessalonians chapter 2 shows us, that there will be another temple built and that at some point the anti-Christ will show up there proclaiming that he is God. I would also like for you to read Zechariah 12:10- , [And I will pour upon the house of David and upon the inhabitants of Jerusalem the spirit of grace and of supplications, and they shall look upon me whom they have pierced, and they shall mourn for him as one mourns for his only son, and shall be in bitterness for him, as one that is in bitterness for his firstborn. In that day shall there be a great mourning in Jerusalem.] Let me tell you something my fellow Christians. Almighty God is not through with Israel! 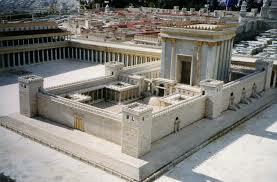 When the proper time comes, Israel will build the third temple! I don’t know if YaHVeH will send an earthquake to demolish the Dome of the Rock and Al Aqsa Mosque or if the Israelis will finally destroy these places or if they will be peacefully dismantled or if some other disaster will usher in the demise of these Islamic structures, but this one thing I do know: all of the Holy Bible will be fulfilled in due season and there will not be enough foreign armies to prevent it from becoming reality. Many in Israel will look upon Yahshua Jesus the Son of YaHVeH whom they pierced and they will weep remorsefully over their error and I believe YaHVeH will grant them mercy. Yahshua Jesus will return for His church at the appointed time of the Heavenly Father YaHVeH. I encourage you my brothers and sisters to continue steadfast in your faith in Christ our Redeemer. We live in treacherous times that would cast doubt on all that we hold dear, but do not be discouraged. We walk by faith and not by what our five senses tell us. We trust in what the Holy Spirit inspired in the Holy Bible and not by what scientists, false religions and others say. As for me and my house, we will serve Almighty YaHVeH. We will not fear mockery, beheading, persecution, the reign of the anti-Christ, the evil designs of anti-Christ progressives or anyone or anything else. Our hope and faith is rooted in Almighty YaHVeH until that day, that He grants us eternal life by His great love and grace: blessed be His name. The Apostle Paul was born into the tribe of Benjamin as a descendant of Abraham, Isaac and Jacob. He is one of the most famous Israelis of all time. He was also a Pharisee and persecuted the early Church Christians not long after the death of Yahshua ha Meshiak (Jesus the Messiah). He was guilty of throwing many Christians into prison and aiding in their slaughter. Saul of Tarsus, as he was known at the time, was on one of these persecuting missions to Damascus, when he was stopped cold in his tracks by Christ Himself, as recorded in the Book of Acts chapter nine. At that time Saul was not a believer, but he was a changed man after that day. In first Corinthians 15:5-8, Paul gives a list of people who saw Christ alive after He was crucified and buried, and he includes himself in the list. This same Paul wrote a large part of the New Testament under the anointing of the Holy Spirit and he wrote in 2 Thessalonians 2:3-4: “Let no man deceive you by any means: for that day shall not come except there come a falling away first, and that the man of sin be revealed, the son of perdition; who opposes and exalts himself above all that is called God or that is worshiped; so that he as God sits in the temple of God, showing himself that he is God.” Please notice, that the man of sin, also known as the anti-Christ, sits in the temple of God. This event is still in the future, and the Holy Spirit inspired Paul to write about it. Fact: the temple of God will be built once again. Every single prophesy ever made in the Holy Bible has come to pass at the proper time, and never has one of these prophesies failed. Prophesies made hundreds of years in advance have come to pass perfectly. This is an exciting facet of Judaism and Christianity, that proves beyond any reasonable doubt the trustworthiness of YaHVeH, Yahshua and the Holy Bible. Micah 5:2 prophesied hundreds of years in advance, that the Messiah would be born in the city Bethlehem/Ephratah and that His goings forth have been from eternity past. Isaiah 9:6-7 prophesied that this Messiah Son would be Almighty God. Isaiah 7:14 prophesied, that a virgin would give birth to a son called Immanuel/God with us. Psalms 22:6 prophesied that this person’s hands and feet would be pierced. Isaiah fifty-three prophesied, that this Messiah would suffer horrendously for our sins. There are many more prophesies in the Hebrew Bible/Old Testament, that Yahshua ha Meshiak fulfilled to exact details. I want to say it again: The Holy Spirit inspired the Apostle Paul to write about the future temple that will be built. It is no accident that Jews wail at the Wailing Wall (Western Wall) over the destruction of the first and second temples. It is no wonder that Satan incites so much opposition against Christians, against Israel, and against the Holy Bible. Satan realizes the integrity of Almighty God and he fears Him greatly. Satan/Lucifer knows what is written in Revelation chapter twenty about his being bound and cast into the abyss. He knows that his time is short and he is afraid and filled with fury. It is no wonder that the Muslims are filled with anger every time Jews ascend the Temple Mount. It is no wonder that Allah is afraid, that Al Aqsa Mosque and the Dome of the Rock will be destroyed. It is no wonder, that Muslims and Arabs feel such hostility and panic at every move made by the nation of Israel. YaHVeH the God of Israel and of Christianity has demonstrated His sovereignty and great power again and again. It seemed like the prophecy of Ezekiel 38:8 would never come to pass. From the time Israel was dispersed among the nations in 70 A.D. until 1948 A. D.,when Israel once again became a nation, was 1878 years. Can you imagine that? Israel supernaturally maintained its identity for over 1800 years and has again taken possession of its ancient land from which it was exiled. This in itself is a miracle. You better believe Allah and the Muslims are afraid of what YaHVeH is doing. You better believe that the rulers of the earth are nervous about Israel. Just as sure as Israel fulfilled the prophesy of returning and taking possession of their ancient homeland, they will also rebuild their temple when the time is right. There are not enough armies in the world to stop it from happening. There are not enough Muslims and Arabs in the world to stop the fulfillment of YaHVeH’s prophecy concerning the temple. Go ahead you rulers and peoples of the earth and try to divide the land of Israel and try to stop the words of YaHVeH. It is an exercise in futility and will be frustrated at every turn. Blessed be the name of YaHVeH, whose promises and testimonies are sure and reliable. Blessed be the name of YaHVeH, who reigns eternally in wisdom and in power. Blessed be the God of Abraham, Isaac and Jacob whose name is YaHVeH. Blessed be YaHVeH’s Son Yahshua, who is the King of Kings and Lord of Lords. Blessed be YaHVeH’s Son Yahshua, who has washed us from our sins in His own blood. Blessed be YaHVeh for the promise of eternal life for all those who put their trust in Yahshua His Son.